The term 'contrate wheel' is a fairly unusual synonym for what is more often known as a crown wheel (because its appearance is similar to a crown). For the first few years, Hornby referred to this as a "contrite wheel" (sic), but at least that was corrected. The word 'contrate' is probably only still used today because of its inclusion in the Meccano system. Two very early parts in the Meccano system, designed to transmit drive when the axles are at 90 degrees. 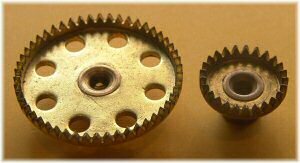 Later on, bevel gears were introduced to do the job better, but contrates were by that time stamped out from sheet brass and thus much cheaper to make. Although they were only included in outfits from 8 upwards in the 1937-on sets, they were included in the Gears outfit and thus are very common parts. They are also used as clutches, since a pair of equal size mesh perfectly and only take a fraction of a revolution to do so (unlike the dog clutch, which can take up to half a revolution). The 50-tooth part 28 also meshes perfectly with a 50-tooth gear part 27. 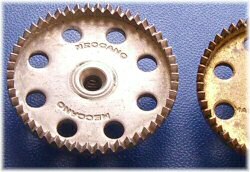 Since the large contrate is a common part with 8 holes it is often used as the crown wheel on a differential, and the smaller contrates used inside the differential instead of bevels. Sadly, part 28 was never made with six holes and therefore cannot be easily used to make a spur differential. The first contrate wheels were milled from solid brass, before the invention of the patent boss in 1911. The photo to the right of three different solid small contrate wheels shows the variation in size of these early contrates. With the introduction of the plastic gears in 1979, the same variations are seen with the boss as happen with the spur and pinion gears parts 26 and 27. Initial UK-produced parts have a slightly longer boss than the later ones. Parts marked Meccano England have a long boss, but some are known with a shorter boss. These may have been parts manufactured in France in the early 80's. Later French parts (with the stamping just Meccano) have shorter bosses, as do the 1990's versions in black. Here's a strange duck – a nickel-plated contrate. The stamping appears to be late pre-war (about mid-30's), but it is nickel plated as you can see by the brass one next to it. The tappings are brass internally, showing that it appears to have been nickel plated before it was tapped. Perhaps it was dropped in the nickel tank by mistake, says Michael Conduit? Richard Payn (and others on Spanner) describe a way of reversing the boss on the plastic contrate wheels. One way of doing this using common Meccano parts is shown to the left. A long bolt is placed through the boss of the contrate, and on the other side a pair of double brackets and a large washer complete the "boss puller". Tighten the nut slowly and the boss will come out cleanly. You can then press it in the other side, as shown on the example to the right. This is a very useful space-saving part, and might even pass as "genuine Meccano" depending upon how strictly you interpret the rules! Click on the ALL at the bottom of the 28 column and pictures of several large contrates with no holes will appear. It's not only plastic gears that have variable length bosses; I have one 28 from a gears A stamped 'MECCANO' 'MADE IN ENGLAND' on either side of short ¼" boss, and a pair stamped 'MECCANO' 'MADE IN ENGLAND' on either side of long 19/64" boss showing as a mirror image inside the crown, from an 8X (new in HK Spring 1981), and a spare bought because I couldn't find the 8X in 1979 in UK. Also a black plastic 28p, moulded (not stamped) "MECCANO" and bar (which doesn't quite obliterate 'ENGLAND'), '50' and '2' short ¼" brass pummel, Allen socket grub screw in a 1995 Evolution Set 2 with a 26n zinc 11 tooth pinion. Note that whereas only 27d of the brass gears has '60' as the No of teeth stamped on it, in my vast sample of 3 plastic gears, all 3 [27a @57, 27c @95 and this 28p @ 50] have the No of teeth moulded on. I suspect this is a multi-cavity mould and the moulded 2 is to distinguish which cavity it comes from for fault diagnosis. The 27a has a moulded A which I believe serves that purpose too. Picked up 4 28's recently, 3 UK and 1 French and noticed the French 28 has a higher wall height on the circumference and tighter radius giving a flatter bottom to the gear. I recently purchased on ebay a contrate gear from the UK. After close examination I find its stamped meccano (x2) and Paris. Is this genuine? Reply: It certainly sounds like it, a genuine Meccano France part. Many were stamped Paris, very early ones and most later parts were stamped Meccano France. 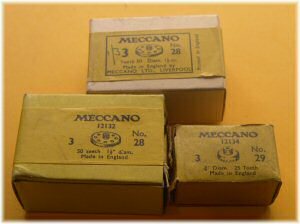 i also have a nickel part 28, mine is single tapped and stamped meccano x3. i'll send a photo when i put my hand on it.